I remember going to the Plaza with my girlfriend Patti to see Walking Tall 2 in November 1975. The Plaza 1&2 was built in 1974 by Butterfield Theatres in the parking lot of Grant City, now Meijer. It was TC's first twin. 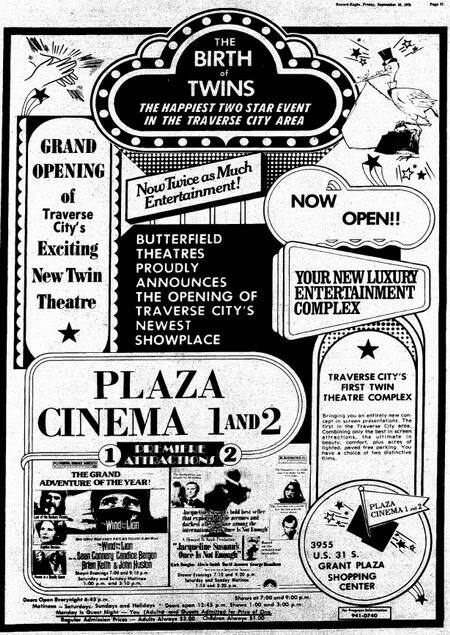 In 1984, The Plaza, along with sister cinemas the State and Traverse Bay (then called the Grand Traverse) were sold to GKC. Sadly, the fate of the Plaza was sealed when GKC built the then-new Grand Traverse Cinemas just down the road at Grand Traverse Mall. The property was sold to Meijer, who demolished the cinema in 1993 for parking space. Today, the part of the Meijer sign where the Plaza's sign used to hang hold its gas station price board.